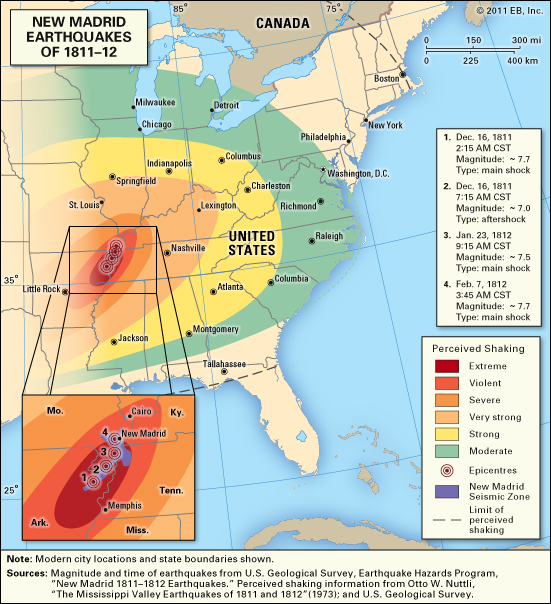 Shortly after 2 o’clock on the morning of December 16, 1811, the Mississippi River valley was convulsed by an earthquake so severe that it awakened people in cities as distant at Pittsburgh, Pennsylvania, and Norfolk, Virginia. This shock inaugurated what must have been the most frightening sequence of earthquakes ever to occur in the United States. Intermittent strong shaking continued through March 1812 and aftershocks strong enough to be felt occurred through the year 1817. The initial earthquake of December 16 was followed by two other principal shocks, one on January 23, 1812, and the other on February 7, 1812. Judging from newspaper accounts of damage to buildings, the February 7 earthquake was the biggest of the three. This entry was posted in Earthquakes and Natural Disasters on December 18, 2014 by clubjosh.